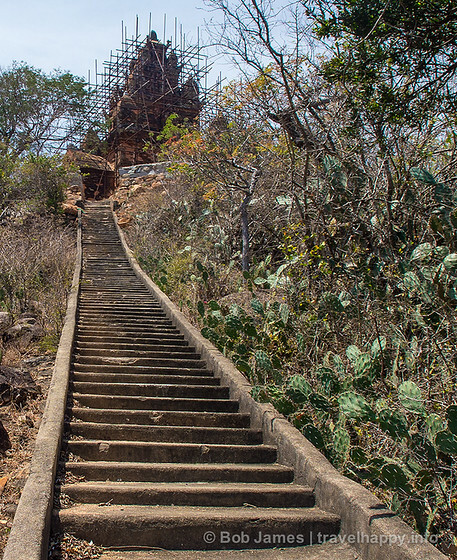 Considered by most little more than a bump in the road between Mui Ne and Nha Trang, Bob James finds that Phan Rang-Thap Cham holds hidden surprises for visitors looking for an isolated beach, a glimpse into a fading chapter of history, and some unique handicrafts. 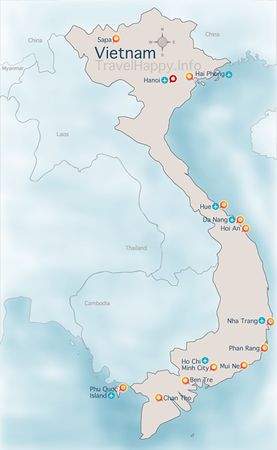 Twin cities serving as the capital of Ninh Tuan Province, Phan Rang and Thap Cham host very few overnight guests (none at all, in the hotel-less Thap Cham). But those who do stay will find a small town full of friendly, welcoming locals and a day’s worth of quality sightseeing in what was the last capital kingdom of the Cham Muslim/Hindu minority. PR-TC is located at the junction of National Routes 1A and 27 connecting Hanoi and Ho Chi Minh City with the central highlands. Buses, including the “open tour” lines, pass here regularly, some stopping for lunch or a call at one of the city’s two remaining Cham towers. It’s also connected to the North-South Railway at the Thap Cham rail station, which sees express passenger trains stop regularly. Dodgy motorcycle taxis will take you into town from either bus or rail station, or passenger cabs can be arranged to prettier Ninh Chu seven kilometers east. Negotiate carefully in advance, however. For those looking for deserted white sand beaches almost as nice as Nha Trang or Mui Ne, Ninh Chu is the place to stay. There’s no shortage of accommodations there, some quite pricey. If you want to experience town life, however, you’ll mostly find low-end guesthouses, such as the Fa Ra on Thong Nhat St., or, a better choice, the very-easy-to-find Ho Phong Hotel with its conspicuous rainbow of exterior lighting. Prices run $15 or under for standard rooms at either. If you’re there to escape the crowds and soak up the sun, then you’ll be happy hanging out on Ninh Chu beach. But the more adventuresome will hire a taxi for a day trip to explore the history and culture of the Cham region. There are few, if any, organized tours, so spending about $50 for an all-day private taxi driver (or guide, if you’re lucky) is about the only way to go. From the seventh to 18th centuries, the Kingdom of Champa spread from what is now Hue to the northern edges of the Mekong Delta. Founded by Lady Po Nagar, to whom a tower dedicated to her stands outside Nha Trang, Champa began to decline after a war with the Khmer kingdom in 1177 and was reduced to the area around Phan Rang (then called Panduranga) after the native Viet Kinh killed or captured 120,000 Chams during their invasion in 1471. Hindu in origin, the Chams converted to Island during the mid-1600s, although the majority of Vietnam’s 91,000 remaining ethnic Chams remain Hindu. The Cham people who escaped to Kampong Cham Province in Cambodia and Hainan island in China (where they are known as the Utsuls) are almost entirely Muslim. Historically, all that remains of the Cham kingdom are towers (temples) scattered around Vietnam’s southeast. 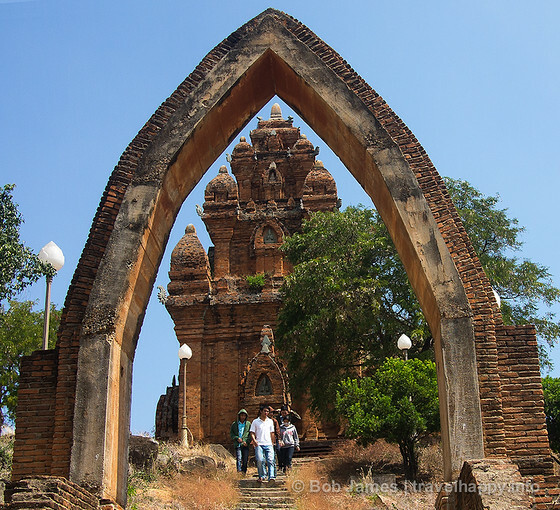 Built with brick in a Hindu design, two of these ancient structures built around 1200 A.D. remain within driving distance of downtown Phan Rang. Po Klong Garai tower is the more popular of the two, as it’s only eight kilometers outside downtown. 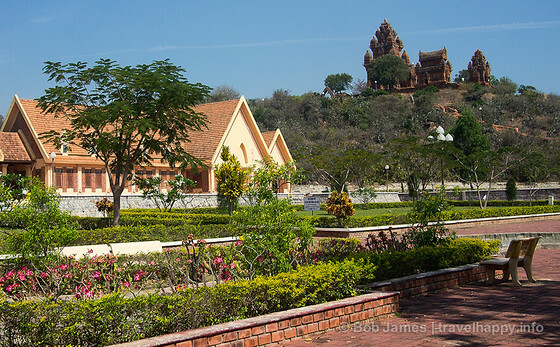 The towers were built to honor a Cham king who was known for his good works for the people and the structure sits atop an easy-to-climb hill with a modern photograph gallery, gift shop & well-tended plaza below. The tower itself is still in good condition and is used frequently by the Cham people as a pilgrimage destination, with many praying or chanting before the figure of Po Klong Garai. Po Ra Me tower is far more remote and it’s likely you’ll be the only visitor when you arrive at the site about 22 kilometers out of town. A single caretaker, who’ll hike up the steep, towering steps to unlock the temple’s main chamber, tends it. The area can be very warm, so bring water. It’s a long climb. But the view from the top is even more impressive than the tower itself. At the time (Spring 2012) , the tower was undergoing some repairs. Bamboo scaffolding surrounded it and goddess Po Ra Me actually had been relocated to a shed behind the brick structure. The caretaker opened it in exchange for a tip. Leaving Po Ra Me, you should make a stop at the two nearby Cham villages of Bau Truc and My Nhiep. Both of these are working craft villages, with Bau Truc devoted to earthenware pottery and My Nhiep for weaving. My Nhiep seems a bit more attuned to the tourist trade, with weavers seemingly only sitting down to their looms when visitors arrive. A walk, rather than drive, through town likely would uncover some smaller knitting houses. Local seemed happy to have guests, which were mostly Vietnamese school or college kids. 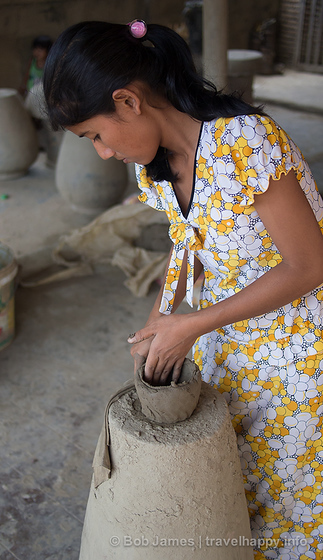 In Ban Truc, the entire main street is filled with pottery shops, most open to the public. The craftwork here is notable in that potters – almost all women – don’t use a kickwheel and, instead, walk in circles around a pedestal to mold vases and jars. Phan Rang-Thap Cham isn’t going to be the main highlight of anyone’s Vietnam visit. But as a chance to see some history and real life, without tourist mobs, it’s a great 24-hour stop.